I wanted to share thoughts on the opportunity and progress of Chadron High School pursuing a 1:1 iPad initiative with our students. In our quest to best prepare students for their futures, we have worked collaboratively with our tech department in providing trainings to incorporate technology into our content areas. 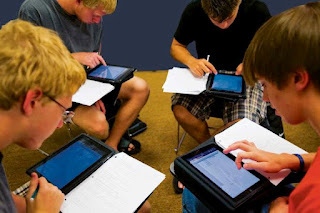 We have fast approached the opportunity to put mobile technology in the hands of every student via ipads. Today, I met with Dr. Winchester (Supt. ), Uati Paopao (Tech Director), and Matt Coats (Apple Representative) to discuss options and financing to provide an ipad for every student. As any veteran teacher knows, textbooks are just a guide of lessons. All teachers supplement the curriculum with their own activities to provide for depth and challenge-based learning. IPads would eventually give the teachers (and students) the same opportunities to provide supplements with much more interaction and depth. We know this venture will take time and training, but we believe it best prepares students to cope with the technology they will be working with in their futures. Quality teachers still drive the content and curriculum, it is our goal that a 1:1 technology implementation will allow our teachers to meet the Chadron Public School Vision Statement: Infinite Possibilities - Infinite Education, Opportunities for All! The current plan is to begin exploring the option of a 1:1 iPad disbursement for the high school students first. Then eventually, the middle school and elementary schools. Since Apple and Itunes requires accounts for clients of at least age 13, we have more options to use apps and apple software intertwined with actual curriculum and course needs due to the age of high school students. We would begin exploring plans to place ipads with the rest of our student body the following year. Rental or lease agreement costs would need to be absorbed by other cost-savings efforts. A few obvious examples is the reduction of the use of textbooks, paper, copy toner, and some general classroom supplies. The largest savings will come from the reduced need to buy pallets of paper and copy toner. We haven't fully explored this but with the use of digital devices, we hope to eventually become a paperless school ... or at least much more of one. Though some patrons may argue that facilities are our biggest financial concern at this point, the truth is, preparing our students with a quality education that prepares them for successful futures will always be our biggest concern. Teaching with technology is not just for the sake of preparing students that will be taking online college courses, but prepares students for the technology involved in everyday management and employment opportunities. We look forward to sharing our plans and hearing input from students, parents, staff, and patrons on this new endeavor. Feel free to comment your thoughts to this blog. CHS 11th Grade Scores 8th Highest in State Writing Scores! We are proud to see the announcement today that our Chadron High 11th graders scored the 8th highest ranking in the state for schools our size (C1). We had the highest scores in the entire panhandle. We are very proud of the excellent job of our students and staff!!! Gov. Heineman requested that we pass along the files below with regard to NeSA Writing Assessment Scores for the 11th grade arranged by NSAA classification. After the State of the Schools report last fall, the Governor shared similar breakdowns for NeSA-Reading and NeSA-Math scores. 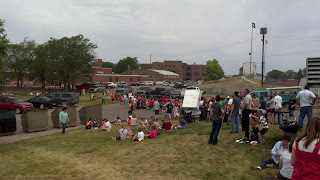 We ended the school year with a community picnic including all K-12 schools. Thanks to the Chadron High School Student Council and Central Office for sponsoring this event. Over 500 hamburgers and hotdogs were served to students, staff, and patrons.